'The world of the film is yet another beautiful, imaginative and memorable milieu from Studio Ghibli'. The lesser works within the Hayao Miyazaki Collection have so far generally proven to be films which offer something notably more simplistic than Miyazaki's more acclaimed efforts. Whilst Howl's Moving Castle certainly cannot be considered oversimple - quite the opposite in fact - it ultimately ends up as one of Miyazaki's relatively less successful films. There is a huge amount going on within Howl's Moving Castle, something which initially works to the film's advantage. Surrounding the central relationship that develops between Sophie (Chieko Baishô) and Howl (Takuya Kimura), Miyazaki crafts a multi-layered fantasy universe in which magical powers are commonplace, technology has a steampunk flavour, and being waged in the air is an international conflict with distinct echoes of the Second World War. It's a set-up which works well for at least the first half of Howl's Moving Castle thanks to the director maintaining tight control, ensuring that the main story remains the most important part of his film whilst also making room for the background elements to poke through regularly and pleasingly. As his film progresses, however, Miyazaki allows matters to become more and more overcomplicated. As both the magical and warfare threads gain greater prominence, steadily encroaching onto Howl's Moving Castle's main plot, Miyazaki starts to lose control - not entirely by any means, but enough to make the second hour of his film feel notably less successful than the first. An apt comparison from within the director's earlier work is Princess Mononoke, a film with a similar level of complexity to Howl's Moving Castle but handled much more successfully than it is here. Whereas in the earlier film Miyazaki's direction was comprehensive and enhanced the overall experience, here it feels as though he allows the many different strands of his story to pile discordantly on top of each other. As the plot unfolds, keeping track of its ever-increasing amount of intricacies becomes a perplexing chore. Already two hours in length, Howl's Moving Castle actually feels as though it would have benefitted from a further thirty minutes or so, in order to allow Miyazaki space to fully develop the multifarious plot threads he introduces. The fact that Howl's Moving Castle isn't based around an original Miyazaki concept also bears mixed results. There are elements taken from Diana Wynne Jones' original novel that fit wonderfully into the director's style and mode of thinking. But there are also parts adapted less successfully by the director, most notably within the cast of characters: Howl's young apprentice Markl (Ryūnosuke Kamiki), whilst a perfectly enjoyable presence, is ultimately given very little to do; less successful still is the Witch of the Waste (Akihiro Miwa), set up pleasingly as a villain at the start of the story only to be rendered an unnecessary and irritating presence during the film's second hour. It's worth noting, as has been the case with previous minor efforts from Miyazaki, that Howl's Moving Castle still has a fair amount of strengths to offer. Both Sophie and Howl are consistently engaging characters, even if their story isn't given the room you'd like it to have during its conclusion; and the world of the film is yet another beautiful, imaginative and memorable milieu from Studio Ghibli. 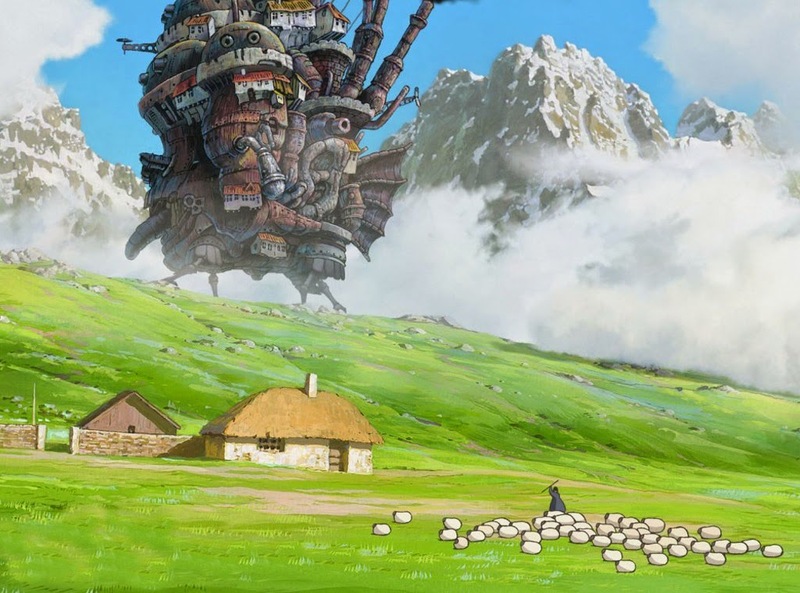 The titular ambulatory stronghold is a particularly impressive and entertaining Miyazaki creation; an early scene in which the castle ambles across the countryside past a field of sheep could have scuttled straight out of the mind of Terry Gilliam during his Monty Python days, and is all the better for it. It's individual moments such as these which make Howl's Moving Castle worthy your time, even if as a whole package it delivers a cinematic experience a few notches below what has come to be expected from a Miyazaki film.